8. Another one was: Doc, I can't stop singing the 'Green Green Grass of Home.' He said: 'That sounds like Tom Jones syndrome.' 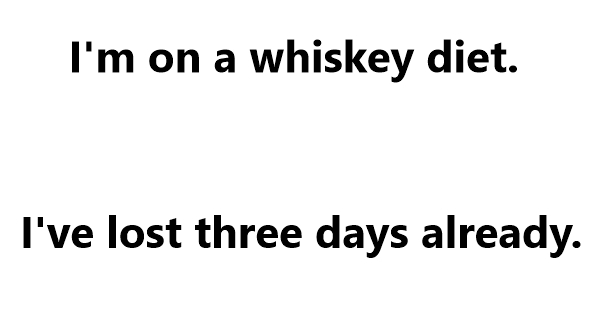 'Is it common? 'I asked. 'It's not unusual' he replied. 11. I went to the doctors the other day, and I said, 'Have you got anything for wind?' So he gave me a kite. 13. I saw this bloke chatting up a cheetah; I thought, ''He's trying to pull a fast one''. 16. I went to buy some camouflage trousers the other day, but I couldn't find any. 17. When Susan's boyfriend proposed marriage to her she said: ''I love the simple things in life, but I don't want one of them for my husband''. 19. I rang up British Telecom, I said, ''I want to report a nuisance caller'', he said ''Not you again''. 20. I met a Dutch girl with inflatable shoes last week, phoned her up to arrange a date, but unfortunately, she'd popped her clogs. 22. Slept like a log last night........ Woke up in the fireplace. 25. The other day I sent my girlfriend a huge pile of snow. I rang her up, I said ''Did you get my drift?''. 26. I cleaned the attic with the wife the other day. Now I can't get the cobwebs out of her hair. 27. Went to the paper shop - it had blown away. 30. I'm in a great mood tonight because the other day I entered a competition and I won a years supply of Marmite......... one jar. 31. So I went to the Chinese restaurant, and this duck came up to me with a red rose and says ''Your eyes sparkle like diamonds''. I said, ''Waiter, I asked for a-ROMATIC duck''. 33. I was having dinner with Garry Kasparov (world chess champion), and there was a check tablecloth. It took him two hours to pass me the salt. 34. There was a man who entered a local paper's pun contest.. He sent in ten different puns, in the hope that at least one of the puns would win. Unfortunately, no pun in ten did. 35. I went down the local supermarket, I said, ''I want to make a complaint, this vinegar's got lumps in it'', he said, "Those are pickled onions''. 40. I said to this train driver ''I want to go to Paris". He said ''Eurostar?'' I said, ''I've been on telly, but I'm no Dean Martin''. 41. Two Eskimos sitting in a kayak were chilly. But when they lit a fire in the craft, it sank, proving once and for all that you can't have your kayak and heat it. 42. I've got a friend who's fallen in love with two school bags, he's bisatchel. 43. You see my next-door neighbor worships exhaust pipes, he's a catholic converter. 45. 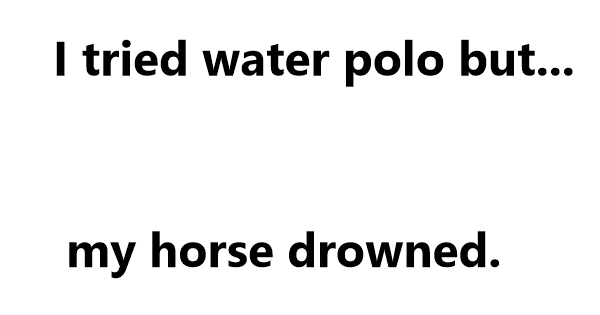 I tried water polo, but my horse drowned. 46. I'll tell you what I love doing more than anything: trying to pack myself in a small suitcase. I can hardly contain myself. 48. Went to the corner shop - bought 4 corners. 49. A seal walks into a club. 51. Boy messages his Girl "Honey, I can't live without you! When are you coming to me? Girl -"Who is dying! I lost my saved numbers, kindly tell me your name?" She got angry and called the first number to find out that was his mother. Then she called the second number on which his sister replied. When she dialed the third number, her own phone rang !!!! Husband took the money and bought a gift for his girlfriend whose name was saved as "Electrician Jimmy." 54.Doctor: "I'm sorry, but you suffer from a terminal illness and have only 10 to live."